Our condolences go out to the family, friends and coworkers. Rest In Peace my Brother in BLUE. Rest in Peace Brother. We’ve got the CO watch now. Thank you Corporal Groves for your dedication and for paying the ultimate sacrifice for the fine folks in the great state of Colorado. You are a true American HERO !!!! My thoughts and prayers are for your family, friends and co-workers. May you forever, rest in peace, my brother. 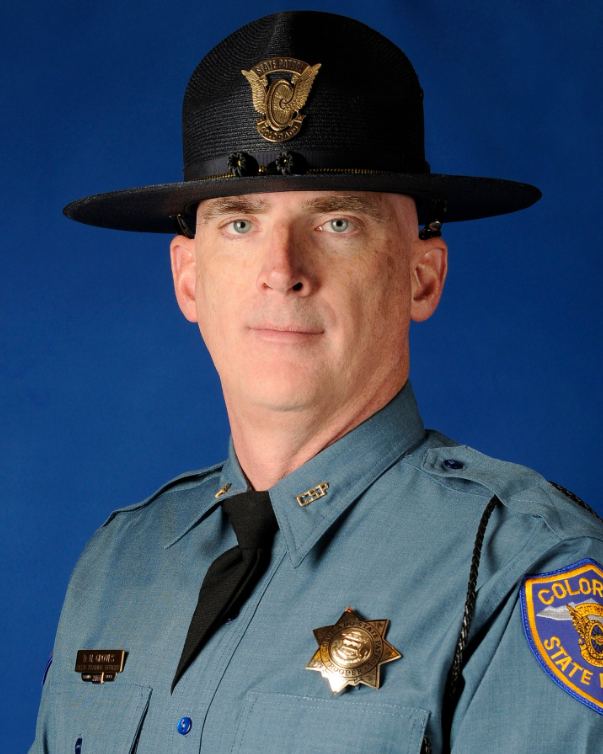 The National Police Wives Association would like to extend their heartfelt prayers to the family of Corporal Groves and the Colorado State Patrol during this time. Thank you, Corporal Groves, for your service. Thank you for your service and your sacrifice, Corporal Groves. Rest in Peace now, Brother. We've got the watch. Our thoughts and prayers are with the family and friends of Corporal Daniel Groves. God Bless! Our department expresses their deep gratitude for services rendered. May the comfort of God dwell on those who remain. My condolences to the family and friends of Cpl. Daniel Groves. Losing a loved one is always difficult. Please take comfort in Jesus words found at John 5:28,29 where he said that there would be a resurrection. Just think of the time when you will see your loved ones again, in paradise conditions, here on earth. Thank you for your service Corporal Daniel Groves. I am so sorry to hear of such an early, tragic death and my prayers are with your family, friends and the Department. Thank you, that you. May you receive HIS rewards!! To the family of Corporal Daniel H. Groves, friends and the Colorado State Patrol, Colorado. You are lifted up in heart, thought and prayers. May God comfort, hold you close and give you His peace that surpasses all understanding to keep your heats and minds through Christ Jesus now and always. Thank you for your service. As I stand Honor Watch over you today, I reflect on your career. You were a member of my first class, 2007-2, a beloved friend of my wife and a man of great character. You will be missed! RIP my friend. Always remembered, Never forgotten! We will hold the line from here. RIP Sir! Heroes never die the become examples for future heroes. heartfelt condolences to the family (blood and blue) and friends of Corporal Groves. Thank you for your dedication to the state of Colorado you will be missed dearly!